Step 1 Spread the eggplant slices in one layer and sprinkle with salt. Let set for 30 minutes to “sweat out” its bitterness. Step 2 Pat the eggplant slices dry and assemble in one layer on a lightly oiled baking sheet. Drizzle generously with olive oil. Place the baking sheet on the top oven rack and broil briefly, turning over so that both sides of the eggplant are softened and golden brown (do not worry if parts of the eggplant are slightly charred, but watch carefully so it doesn’t burn). Remove from the oven and set aside. Step 3 Heat 2 tbsp olive oil in a skillet. Cook the onions on medium heat until they turn slightly golden brown, stirring regularly (about 5 minutes). Now add the ground lamb. Cook the lamb until fully browned, tossing regularly. Drain the lamb from any excess fat and return back to the skillet. Now add the dried oregano, ground cinnamon, pepper, nutmeg, and hot paprika. Stir to coat the meat with the spices. Add the wine and boil for 1 minute to reduce. Stir in the canned tomatoes, sugar and broth. Simmer on medium-low heat for 30 minutes. Step 4 Preheat the oven to 350 degrees F.
Step 5 In the meantime, boil the sliced potatoes in plenty of water until they are completely soft and easily breakable (about 5-7 minutes). Drain the water and set the potatoes aside briefly. Step 6 To prepare the cheese topping, whisk the Greek yogurt with the eggs and flour. Add the ricotta and feta cheese and whisk again to combine. Step 7 When ready, lightly oil a 9 1/2″ x 13″ oven-safe baking pan. Layer the eggplant slices on the bottom. Add the meat sauce and spread to cover the eggplant. Layer the potato slices to cover the meat sauce and sprinkle with the bread crumbs. Finally spread the cheese topping to thinly cover the potatoes. Step 8 Bake in the 350 F degree-heated oven for 45 minutes. If you need to, transfer the baking pan to the top rack and broil briefly so that the top of the moussaka gains a nice golden brown color (watch carefully). Step 9 Remove from the heat and let sit 5-7 minutes before cutting through into squares to serve. Enjoy! 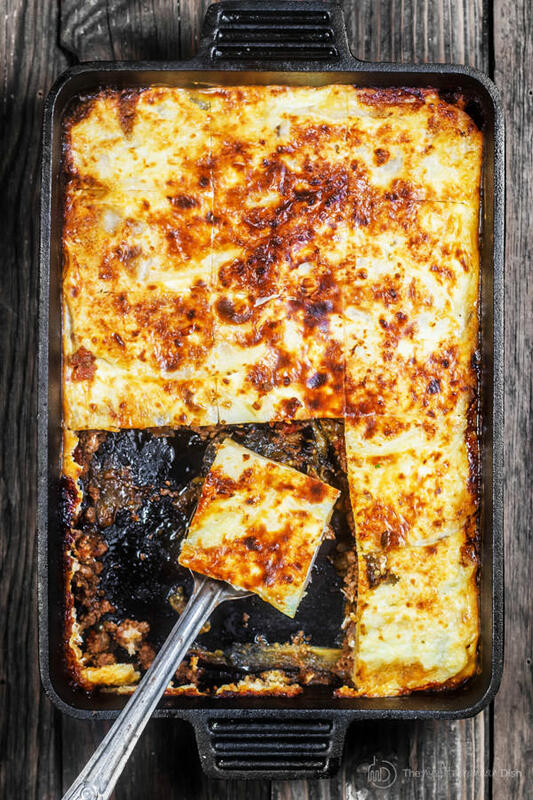 Moussaka recipe: layers of eggplant, potatoes, and a spiced meat sauce nestled in between. Comfort food, Greek-style!